BRANDON, Man. – If Sunday’s showdown was about sending a message, then Jennifer Jones delivered one full of upper-case letters and exclamation marks to her opponent. 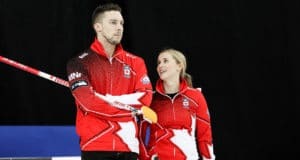 Propelled by a steal of four in the third end, Jones’s Winnipeg team defeated defending champion Rachel Homan from Ottawa 9-5 to win its third Home Hardware Canada Cup, sponsored by Meridian Manufacturing. Jones and Homan have been among the most dominant teams in the country the past few seasons. Along the way, the Jones team won the 2015 Scotties Tournament of Hearts national women’s curling crown in addition to the 2014 Olympic gold medal, while Team Homan won back to back Scotties titles in 2013 and 2014. The big prize for many of the squads at the Home Hardware Canada Cup was a berth into the 2017 Tim Hortons Roar of the Rings Canadian Curling Trials next December in Ottawa. But both Jones and Homan have already earned their spots. In a pregame introduction on TSN, analyst Cheryl Bernard said the final was about each team sending a message about how strong it is to its opponent and other women’s teams heading into the 2017 Scotties Tournament of Hearts in St. Catharines, Ont., in February, as well as the Trials in Ottawa. 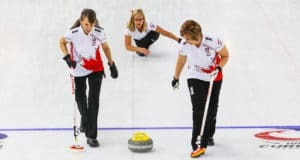 Including their round-robin game, Jones – backed by third Kaitlyn Lawes, second Jill Officer, lead Dawn McEwen and coach Wendy Morgan – outscored Homan 18-9 here. If it was indeed about sending a message, it was a strong one. But Jones wasn’t convinced the final was about message-sending. “We’re leaving tomorrow to go to Sault Ste. Marie to play in another Grand Slam against most of the teams that were here, so we play against most of the teams, there’s mutual respect. At the end of the day, everyone is going to have to play well to win those trials in Ottawa,” Jones said. Jones also won the Home Hardware Canada Cup in 2007 and 2011, and joins Stefanie Lawton and Shannon Kleibrink as three-time winners. Jones picks up $14,000 for the win in addition to the $10,000 the team earned for each round-robin victory. The team will also get to represent North America at the 2017 World Financial Group Continental Cup, presented by Boyd Gaming, in Las Vegas Jan. 12-15. It will be Jones’s seventh appearance in the competition. All week long, Jones had the first-end hammer and except for one game used it to her advantage. During the round-robin it was draws to the button that earned the team that right, but finishing first gave it to her in the final. However, Jones didn’t take as much advantage as she would have liked. The first two ends were played cautiously, keeping the crowd quiet. The first was blanked. In the second end, Homan made a nice freeze on her last shot to force Jones to do an extremely short raise takeout just to get one. But even though Homan had the hammer in the third end, Jones executed a raise with her last shot to sit four making Homan try a raise of her own. But her’s was too light and all of a sudden it was 5-0 Jones. Although the favoured the home-province team in Jones, the crowd remained subdued but this time it was in shock and disbelief over what had just happened. “We had a couple of opportunities that we took full advantage of and made Rachel make a very tough tap, tap against four which I wouldn’t have wanted to throw,” said Jones. Jones kept it fairly clean in the fourth end sitting two after throwing her final rock so Homan had to do a hit-and-stick to score one. Even with six ends remaining, being down 5-1 without the hammer meant they’d dug themselves a hole to deep to climb out of no matter how long a ladder was lowered to them. Jones went to the fifth-end break up 7-1, although she was shooting for more. Guaranteed at least one, she went for a kill shot instead of a draw for two. If she’d executed it the way she wanted her raise attempt would have given her four more but she still managed to get two out of it. Despite being in trouble for much of the end, Homan managed to score two in the sixth to narrow the gap to 7-3. Jones got one in the seventh, although had a chance for two but her raised rock went too far. Homan, along with third Emma Miskew, second Joanne Courtney, lead Lisa Weagle and coach Adam Kingsbury, responded with deuce in the eighth, but it was two that was too little too late. 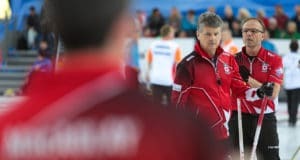 “The team missed too many in the middle there,” said Homan, who settled for the runner-up cheque of $9,000 plus $8,000 for its round-robin victories. “We tried to battle back but down five is pretty difficult to come back from with a team like Jones. The 2016 Home Hardware Canada Cup concludes with the men’s final today at 6:30 p.m. (CST) featuring the Reid Carruthers rink of Winnipeg and the Brad Gushue team of St. John’s, skipped by Mark Nichols.